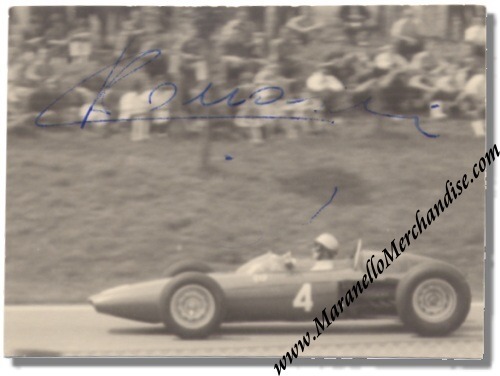 Lorenzo Bandini signed B&W photo, taken at the 1963 Solitude Rennen in Germany. This relatively small photo is printed on card stock-like paper. The photo shows Bandini in his "Italian Red" BRM P578 with which he would finish 4th in the race. The photo was taken by Jochen Gruber and he confirmed to us that he took this picture in 1963 and had Bandini sign it for him the next year, 1964, again at the Solitude Rennen. In 1964 Bandini attended the race with his team mate John Surtees, both Ferrari factory drivers at that time. 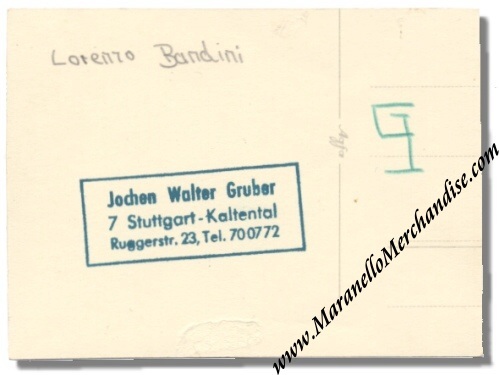 It is a small photo card, measuring some 3.75 x 2.8 inches and has been signed in ballpoint on the front side.